Celebrating new plants that were added to our tropical garden collection during the last two months of September and October… of course, the old-timers are being appreciated too! So many gorgeous beauties, making us giddy with delight, especially me. 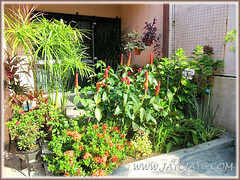 I simply love buying plants to change the scenario in our garden periodically, to make it more interesting and be dazzled by the changes they present. 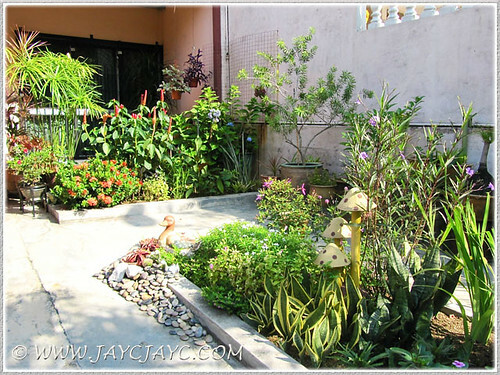 It’s inevitable that all gardens undergo changes due to a myriad of reasons. Whatever, there’s always many good reasons to go plant-shopping. Yet, my darling John would breathe down my neck often times, reminding me that we have more than enough plants to maintain and enjoy. Nonetheless, he’ll listen to my reasons, then mellow out and advise me to be selective in my purchases. His usual speech… buy only hardy, showy and exotic plants that require little maintenance, and juggle the numbers well (if add, then must subtract too) since we’re aging gardeners, no longer having strong muscles and optimum energy. Hehehee… something I often forget! His caution is understandable, but sometimes, it’s really difficult to restrain and buy within his terms when faced with numerous captivating plants that I’d love to hug home! 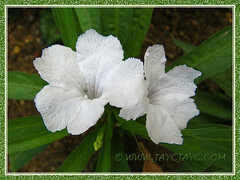 Ruellia brittoniana ‘White Katie’ (Dwarf White Bells), newly added to the outer bed that receives blasting sun all day long. 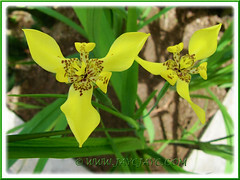 Trimezia steyermarkii (Yellow Walking Iris), recently planted at the outer bed as well. 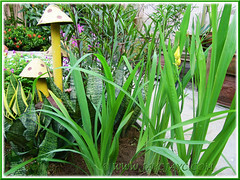 AFTER SHOT: Just to show the newly planted Trimezia steyermarkii (Yellow Walking Iris) sitting well at the outer bed. 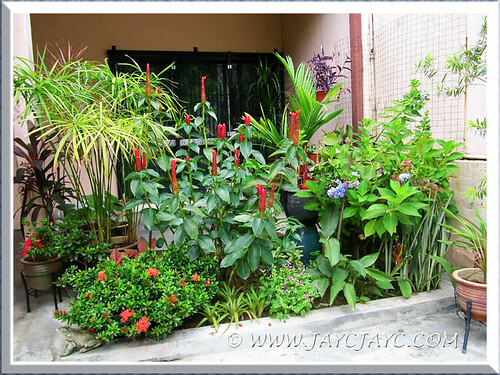 This spot was vacated by the Lemon Grass plants that were replanted into large pots. Arundina graminifolia – another new addition that produces beautiful Cattleya-like flowers on long thin stems, adorned with bamboo-like leaves. 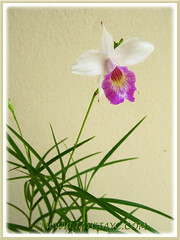 Hence the common name, Bamboo Orchid. Planted the Arundina graminifolia at the inner bed and it appears to be very happy residing there for I observed that a few plantlets have emerged recently. 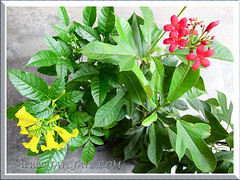 Tecoma stans (Yellow Bells) and Jatropha integerrima (Peregrina, Spicy Jatropha) were added to our garden collection in Sept 27 2013. Needed these bushes for the inner bed at our front yard. Further changes were made at the inner bed which gets morning to early afternoon sunshine. Planted the Spicy Jatropha behind the Dwarf Red Ixora, hoping to cover the vacuum eventually. Added the Yellow Bells, between the Red Ginger and Blue Hydrangea to add a flash of colour to the abundance in red. 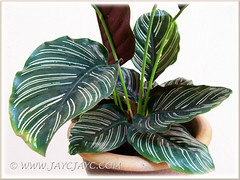 This gorgeously variegated plant, Calathea ornata ‘Sanderiana’ was added to our garden collection in Oct 18 2013. 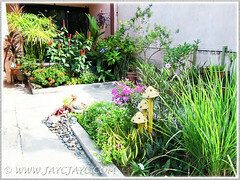 Urgently required for our courtyard, to replaced some plants that have expired. Another attractive variegated plant, Pteris Ensiformis ‘Evergemiensis’ (Silver Lace Fern), joined our garden collection on Oct 18 2013. Reminiscing its beautiful presence at our courtyard many moons ago. Many more plants traveled home with us. 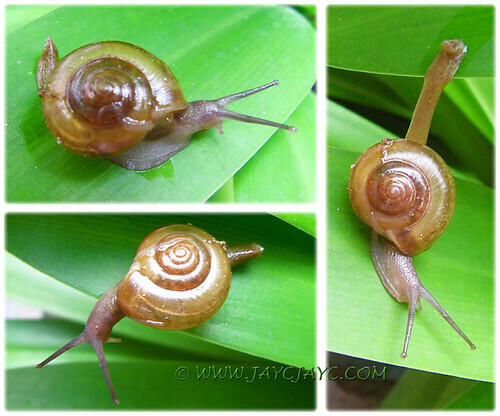 Got these lovelies during our recent vacation to Cameron Highlands. Thank goodness, to-date they’re still alive as plants purchased at the highlands will not usually thrive when brought down to the lowlands! 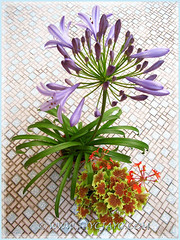 Agapanthus specie and Geranium ‘Vancouver Centennial’, captured on October 28, 2013. Have yet to replant them into a larger pot… thought it’s wiser not to disturb them too soon and allow them to acclimatize first. 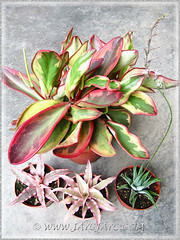 Peperomia clusiifolia ‘Jellie’, 2 varieties of Cryptanthus and an unidentified green cactus (ID please, anyone?). 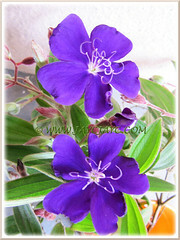 Tibouchina urvilleana (syn. 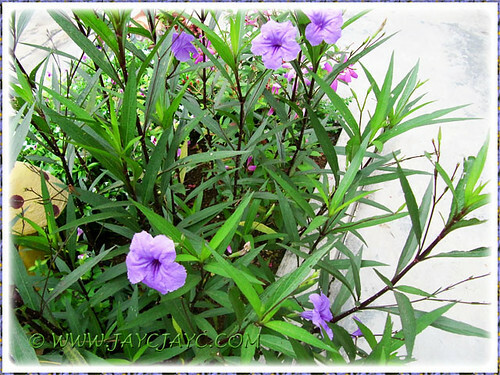 : T. semidecandra), commonly named as Purple Princess and Glory Bush. We took a couple of cuttings from a medium-sized bush by the sidewalk… simply irresistible! I just checked their status and they appear fine… keeping fingers crossed! Weather during the last two months had not been kind, most days wet, causing some plants to succumb to root rot. Too much rain favours soil disease development and I think some kind of root rot fungus has been killing a clump of Yellow Walking Iris and Dwarf Purple Ruellia at the outer bed. The insecticide, Malathion seemed ineffective to rid the fungi and I’ve put on hold planting around that area. We’ve removed the visibly affected soil and plants, debris and fallen leaves. 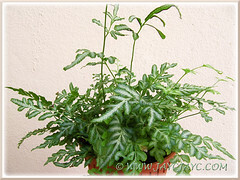 Also, loosen the soil around and allowed it to dry out, watering lightly only when required. So far so good but we think it’s superficial and will recur. Any idea what we should do to eradicate the disease totally? More remedial gardening was carried out. I had known for a long time that the Cheilocostus speciosus (Crepe Ginger) wasn’t happy at all, potted. After much deliberation, we decided to replant it at the inner border, though faced with space constraint. The potted Cyrtostachys renda (Lipstick Palm) that sat on an inverted pot (can you spot it in picture below?) over the previous home of the White Mussaenda had to be relocated to the chain-link fence, and the Caribbean Spiderlily beside it to be shifted a little to the right. Laboriously, my beloved hero had the long-buried root mass of the White Mussaenda removed to provide a space for the Crepe Ginger. Poor dear… I could see him puffing, panting and sweating! The strenuous task took him slightly more than an hour. Great that he took an afternoon siesta, equally long, to recoup his strength and energy. I, on the other hand, procrastinated and tackled my part of the task three days later. It took me an hour and a half to relocate the large clump of Carribean Spiderlily further to the right, then knock off the large pot of Crepe Ginger with a hammer, and carefully replanted 1-3 plants at a time into the ground. Hmm… can’t wait to see their lovely blooms, hopefully soon! On the whole, the gardening months from September to October have been enjoyable and quite eventful for us! It was lovely getting our hands dirtied, planting newly acquired additions, trashing withered or diseased plants, weeding and many other gardening chores. And, the best part is to just stand back to admire our endless days’ labour of love. Emilia sonchifolia (Cupid’s Shaving Brush, Lilac Tasselflower, Flora’s Paintbrush) – my darling John’s favourite weed, a heavy reseeder. 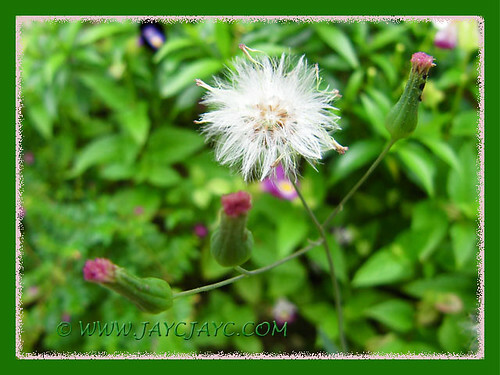 He loves to see the tiny pink blossoms and don’t mind seeing them emerging at every nook and corner. Ruellia simplex ‘Purple Showers’ (Britton’s Wild Petunia, Mexican Petunia/Bluebell), growing beautifully and blooming abundantly at the outer border. Haven for Whiteflies… so we have to be vigilant! 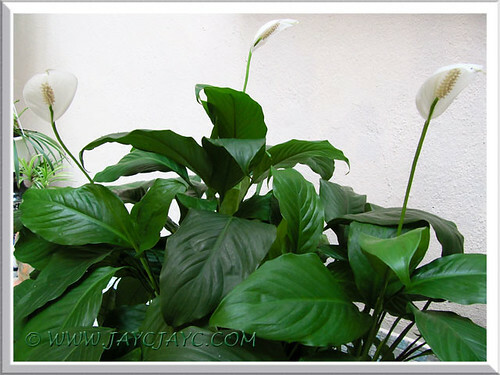 Our potted Spathiphyllum spp. ‘Mauna Loa Supreme’ (Peace Lily), blooming gloriously at the courtyard. Usually one or two flowers at a time but rarely cheered us with triple joy like these! 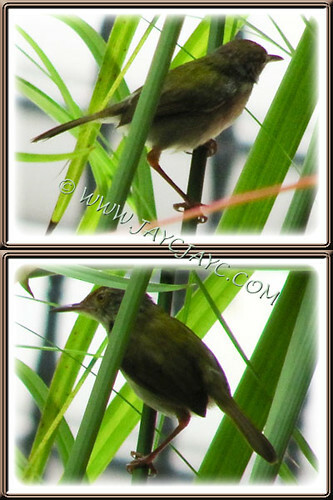 Common Tailorbird, I think! Often seen but just unable to get a clear shot of them as they are so camera-shy and take off at the slightest noise or human movement. 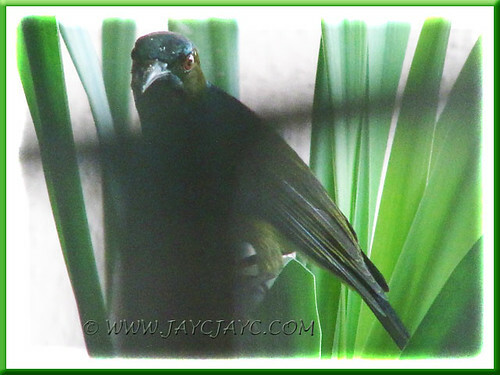 Sorry for the blurred shots as these were captured from within the tinted glass door. 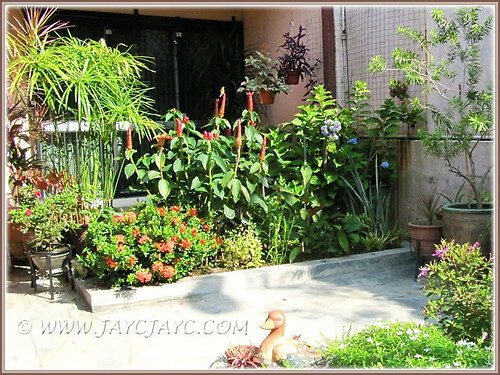 Your garden is looking lovely, and I can tell how much joy it gives you! I love all the colour that you have. Have a lovely Saturday and a wonderful weekend. I enjoyed seeing your garden updates. Truly it must be laborious & indeed very rewarding to see all in its right places. I wonder what had happened to your orchid collections? I see only one hanging pot now compared to before. Thanks James… delighted to know you’ve enjoyed as much as we love sharing! 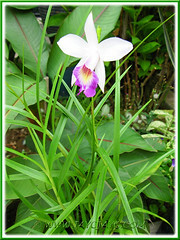 So sad… gone are those glorious orchid shows in our garden. So many have come and gone, so much so killed our enthusiasm to grow any now. You’re right, we have only one pot of unidentified Cattleya which last flowered 7 years ago… may trash it soon. Instead, we’ve added a clump of Bamboo Orchid and hope to add the Ground Orchids one fine day (like your gorgeous ones which got me smitten ;-) ) – think these are easy-to-care and are much better bloomers!